"Cooking Vegan" & more vegan cookbook reviews Vegans Eat What? 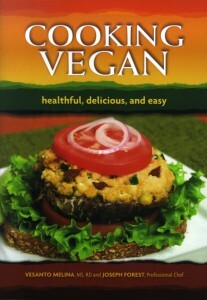 Help support VegansEatWhat.com by buying this cookbook online. We do not know how this book was published several years ago without us knowing about it. We only learned of it recently! Vesanto Melina has long been considered the expert in vegan nutrition. She and Brenda Davis are two registered dieticians that have collaborated on several vegetarian and vegan nutrition books over the years. In fact, this book is an excellent companion to Melina’s previous publications Becoming Vegan, The Express Edition, as well as Becoming Vegan, The Complete Reference to Plant Based Nutrition (Comprehensive Edition). Both books were published by the Book Publishing Company in 2013 and 2014 respectively. All have places on our bookshelves, both to read and to use as reference materials. In her latest book, Ms. Melina collaborates with Joseph Forest, an experienced chef of many years. Mr. Forest has a varied background which includes cooking for fine hotels, upscale restaurants, and film crews. He has also made appearances on television and radio. The beginning of the book includes commentary on what is involved in practicing a vegan diet, discussing what is included in it and what is important when adopting such a diet. Interestingly, although this discussion is relatively short, it is very thorough. Each recipe in the book includes a complete nutritional analysis so those who are interested in these data have them easily at hand. Also included in the book are charts that group foods according to six tastes and twelve different menus (including breakfast, lunch, dinner and snacks). The recipes offered include international options as well as children-friendly menus, raw food options, and selected holiday choices. We tagged many of the recipes to try. Although we are not finished sampling recipes from this book, to date we have tried Shiitake Mushroom-Miso Soup, Curried Kabocha and Chickpea Soup, Red Lentil Soup with Miso, Spicy Eggplant Soup with Chickpeas and Olives, Stir Fry 101, Vegan Chick’n Paella with Artichokes and Spinach, and Spinach with Tofu and Garam Masala. The recipe presented below is Spinach with Tofu and Garam Masala. This reminds me so much of the traditional “Saag Paneer”, and also a vegan version of it that used to be sold in a local deli – Saag Baaj. I loved this dish, and am sure that you will as well! You may vary it to your tastes. We toned down the heat a bit and did not use the oil but simply sautéed in water. You may choose to add more spinach or try the collards variation that is suggested. So many options, all of them wonderful! Steam the spinach over medium-high heat for about 3 minutes, or until just tender. Heat the oil in a large skillet over medium heat. Add the onion and cook, stirring occasionally for 3 to 5 minutes or until soft. Add the garam masala, coriander, garlic powder and salt and cook for 2-3 minutes more, stirring frequently to prevent spices from sticking to the bottom of the pan. Transfer the steamed spinach and the onion mixture to a blender or food processor. Add the lemon juice and process until smooth. Transfer the spinach mixture back to the skillet and add tofu and cook over medium heat until the tofu is heated through. Serve hot. Make this dish without the tofu. Replace the spinach with stemmed and chopped collard greens and add 3 T of the cooking liquid from the steamer when processing the greens. The calcium in collard greens is more readily absorbed than the calcium in spinach.